If a planner isn't for you, try bullet journaling! 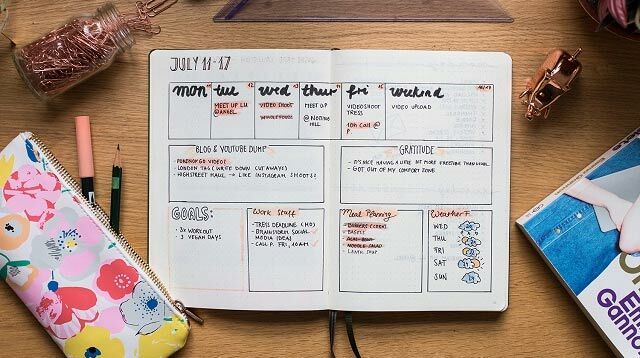 Though the idea of rapid logging is still bullet journaling's best quality, the system's knack for functionality and customization is what makes us love it even more. The idea of having your own setup that tracks your personal tasks, priorities, and goals puts it miles ahead of a store-bought planner. In a way, bullet journaling motivates you to get organized and creative all in one place. And who doesn't want that? Below, we're giving you proper inspo to convince you to enter the world of bullet journaling. Or if you're already in it, you can check them out to get your creative juices flowing! For the ultimate bullet journal spread breakdown, check out this blog post from Jasmin of Tea and Twigs. You'll definitely get inspired by her lightly colored and very organized setup! Newbies in bullet journaling should try and look for the setup they like best instead of following the trend. Cindy of Classic Sidewalk switched between weekly and daily setups for two months and found that she preferred one over the other. Amanda Rach Lee's setup is one that might work for many beginners. She kept it minimal, straightforward, and easy to navigate. Pattern your first bullet journal after hers and customize along the way! If you love doodling, Kicki Yang Zhang's bullet journal will give you solid inspiration. Her setup is complete with blank pages for random drawings, and her food tracker has boxes for sketching meals! Studywithinspo's bullet journal is customization at its best. The creativity he poured into his setup proves that you don't need the Leuchtturm 1917 to start your bullet journal journey. His moodboard idea was genius!